Put the two together and I’m getting some good sketching time in. I’ve got all my images from my last two trips to Mongolia on my MacBook Pro, sitting in iPhoto, which happens to have a great enlargement function. I’ve set the laptop on a small folding table (are they still called “tv trays”?) and am using a 9×12″ sketchbook. These are drawn with a fine felt tip pen with no preliminary pencil work. I either get it or I don’t. None take more than about five minutes, so there isn’t a lot of time invested. The purpose is to hone in on areas that I don’t understand as well as I should. Purely process, not result. Plus, I keep in mind that photos flatten objects, so I need to compensate for that when drawing three dimensional animals. 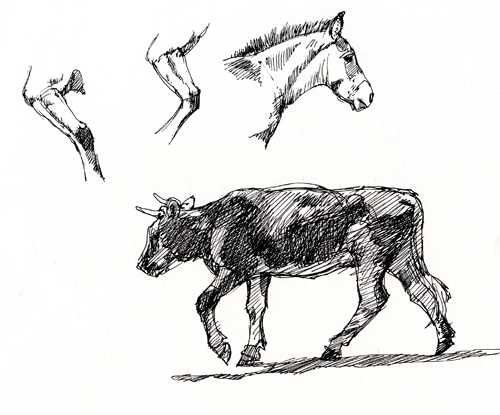 I started with a page of takhi, plus a cow I saw at Hustai. 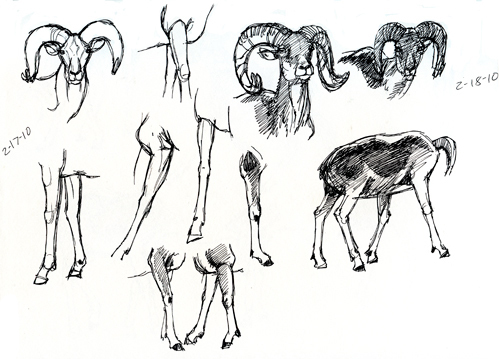 Then I moved on to argali. One of the challenges is to keep the legs and body in proper proportion since the legs are really skinny and long. There isn’t a lot of muscle definition to play with, like with horses, so one has to nail the overall shape. 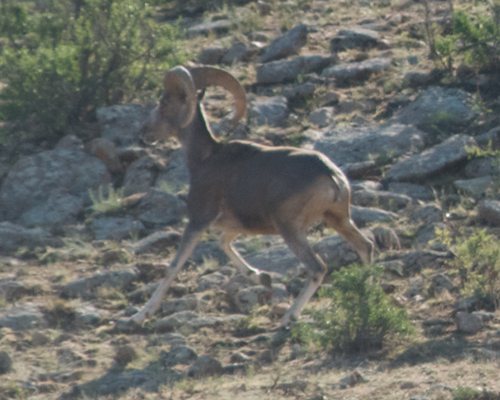 Ideally, I’d have my Leica Televid spotting scope, which would solve the problem, except that it is entirely impractical to haul it around in the terrain where the argali are, at least for me. So it’s photographs and a pair of domestic ram’s horns that I brought back from England some years ago. I don’t have access to taxidermy mounted argali, but the problems there would whether or not the horns are typical, how good the quality of the mount is and is it a Mongolian argali. Notice that I started on the left with only basic shapes and didn’t worry about modeling or “color”. 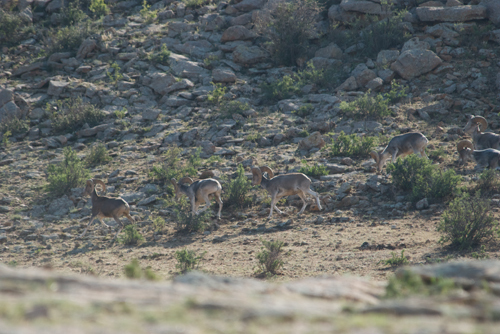 The best images I have of argali so far are a group of six rams at Baga Gazriin Chuluu Nature Reserve. They were considerate enough to have parked themselves in the open within sight of the main road through the reserve in great morning light. I would have been lucky to have spotted them, but the local man living in the reserve who my guide hired to go out with us both mornings that I was there saw them right away. Here’s a long shot from where we stopped. They’re right back against the rocks, in the middle. 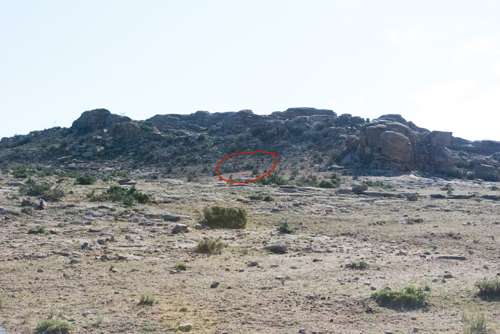 I’ve circled them in red. Piece of cake, right? Here’s what I got when I zoomed in with my Nikon Nikkor VR 80-400 lens. These are 10mg files, so they can take quite a bit of enlargement and stay sharp. I’ve got about 84 images total to work with. There’s something useful in all of them. Love these guys. Here’s a close-up of the three rams in front. A perfect Exhibit A of the subject of a previous post about why you have to get out there and do the fieldwork. There’s no other way to get this kind of reference (Buying it from someone else doesn’t count). Game ranch animals won’t do it either. They’re out of context and, unless you’ve observed the species in the wild, you have no idea whether or not any behavior that you see is “real”. And closer yet of one I drew last night. Everyone was fat and sassy and in great condition. Notice that the younger ram is much browner than the older ones. His behavior was different, too. He was a little more skittish, kept more space between himself and the others than they did between each other and was last in line when they all finally moved up into the rocks. Great stuff! Action, a terrific pose, rim light. 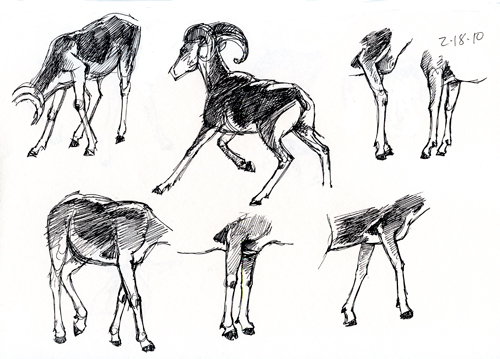 Here’s the page of sketches that include this ram. Give it a try! It’s a great way to keep training your eye. Thanks for the wonderful blog entry. I too am an animal artist and today was doing a huge “studio purge” of old artworks. Looking back to the past makes you really think about the road ahead. The exercises you mention here are wonderful ways to move forward into the future. Thanks again.